Being an important international port and trade metropolis until the end of the 15th century, Bruges attracted merchants from various corners over Europe. These merchants posessed their own nation homes and warehouses. These nation homes were the permanent commercial representations of a country in the town, you could call them medieval consulates. Venice, Genoa and Firenze had their houses on what was then called the "Beursplein", the former financial district of the town. Not far away were the houses of Lucca, Catalonia, Castillia and Leon, Portugal, England and Scotland. The office of the German Hansa was called the house of the "Oosterlingen". All of them were situated in the vicinity of port and were among the most impressive houses in the town. Venetian nation house (house "Ter Beurse"). The history of house "Ter Beurse" goes back to the 13th century when it was an inn, run by the family van der Beurse (hence the name). A marking on the wall refers to the year 1276. It was also an important place for money exchange. 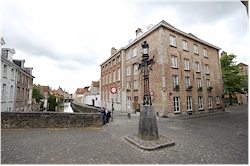 You could say that the square in front of the house was the Wall Street of medieval Bruges. From 1397, the house is used by the Venetians as their nation house and this until they left Bruges. Nowadays it is used by a local radiostation (vbro). Location: Vlamingstraat 35. The house of Genoa (house "Saaihalle"). The house goes back to the end of the 14th century. The facade is very remarkable due to its decoration and large gothic windows. Genoa used this house as their loggia until they left Bruges in 1551. After that, it was used by sayette weavers to which the local name refers. Lateron it had various other functions. Currently, it houses the Frites museum. Location: Vlamingstraat 33. The house of the German Hansa ("Oosterlingenhuis"). Although the German Hansa already had warehouses in Bruges much earlier, they decided to set up their nation house around the middle of the 15th century. 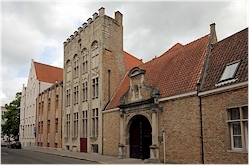 The original building used to be much bigger than the current one and was even called one of the seven wonders of Bruges. The hansa stayed in Bruges until their move to Antwerp in 1555. What remains of the nation house now serves as a hotel. Location: Krom Genthof. The house of Castillia and Leon (house "de la Torre"). Also Castillia and Leon had their own nation house in Bruges. "Huis de la Torre" (the house of the tower) was part of that nation house and is the most visible reminder of it. The impressive screen facade was built around 1500. Location: Spanjaardstraat 16. Picture 3: House "de la Torre"